Our members love the luxury of having three pools. You can slide into our outdoor pool with the kids, take an aqua exercise class, swim laps, or just relax poolside in a lounge chair. Our indoor pools and whirlpool all use a salt purification system, which leaves the water gentler on your hair, skin, and swimsuit. The family pool is heated to 89 degrees and has a maximum depth of 3 feet, 11 inches. 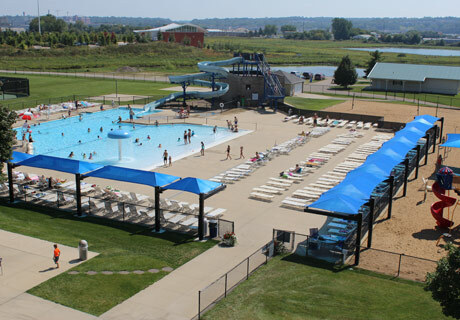 This pool is used for water fitness classes and is always open for family swim. 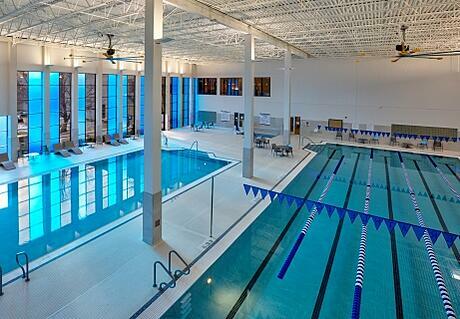 The lap pool is heated to 82 degrees and has a maximum depth of 4 feet, 10 inches. It has five lanes and is 25 meters long. Our family whirlpool is heated to 100 degrees and available for all ages. When lifeguards are on duty, children ages 7-12 may be checked in with the lifeguard. Sun or shade? You decide. Enjoy refreshments as you relax poolside on our spacious deck in one of our lounge chairs. Zero depth entry allows a beach like entry to the water and easy access for young children to play in the water geysers and large “mushroom” fountain. Older kids will love cooling off in the water or banking through the curves as they go down our 185 foot water slide. The pool is not the only outdoor option. Kids can take a break from the pool to play in our playground areas. They can meet friends to play sand volleyball, tetherball, basketball, or play tennis. And when you are all done, everyone can kick back together in the picnic area by the Cabana to enjoy an outdoor meal or summer treat! From Parent/Child lessons for our youngest members to Triathlon Swimming Classes for competitive athletes, we offer group lessons to help you improve your swimming and make the most of your pool time. Preschool, Youth, Beginning Lifeguarding, and Adult group lessons are provided by instructors that are certified Water Safety Instructors with the American Red Cross. See the Schedule of Activities under Swimming for full offerings. We offer private and semi-private lessons to accommodate all skill levels and ages. Tailor your swim routine, improve your stroke proficiency, increase endurance, or simply learn how to swim all at your own pace and on your schedule. For more information, including instructors with different specialties, see the Schedule of Activities under Swimming. Join in with our passionate group of aqua class exercisers in the warm water of our Family Pool! 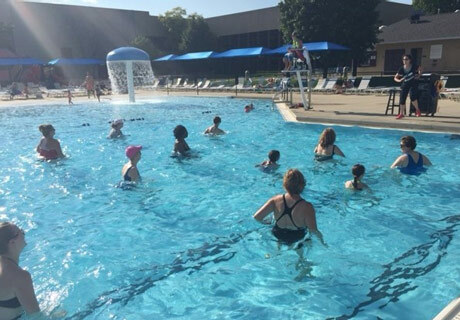 Aqua classes are included with membership and are available a variety of formats including: Interval, Stretch and Tone, Yoga, and even Aqua Zumba classes. See the Group Fitness Schedule for classes and times.